Description: While there are many railroad bridges that cross the Grand River, there are none quite as picturesque as the swing bridge linking Ferrysburg with Grand Haven. Here Michigan Shore's southbound road train is seen with all three of the railroad's engines crossing the river. The conductor must close and reopen the bridge for river traffic after the train has cleared, as the bridge hasn't been staffed in decades. In the CSX era right up until the sale of the line in 2005, the conductor rode in a caboose on the end to expedite this process. Description: An Alco S6 and an MLW S13 have a long train of autoracks in tow as they smoke their way through downtown Ingersoll, ON, right before sunset. The racks were just pulled from the CN interchange and more are waiting east of town, having been brought in from the CP interchange by the Woodstock Turn. OSR serves GM's CAMI plant (which builds the Chevy Equinox and GMC Terrain) which is currently shipping out 90 cars a day! Title: Merry Christmas from CN! Description: Beautiful Illinois Central E9's 101 and 100 lead CN's Santa Train south to Flatrock near River Rouge. Description: Q327's conductor gives the engineer of Amtrak train 370, the "Pere Marquette", the highball signal as the train glides into Wyoming yard and finally to the Grand Rapids Amtrak station. Title: Uh, what are you doing? Description: A real winner thought he could sneak around behind the 816 on the rear of P370. Needless to say he found his path blocked by a snow pile and poles. Eventually he backed out of there as the train pulled out. 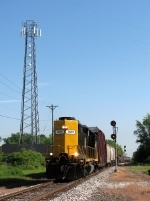 Title: Z151 holds north of the CSX property line at Turner St. Description: CP ES44AC 8880 leads 2 CP veteran SD40-2's west on train 35T, which had just met 36T. Description: Freshly rebuilt ex SOO SD60 trailing on 36T. Formerly SOO Line 6050. Though I prefer SOO paint, the CP paint looks great on these! Description: Heading north past the signals for Fuller diamond, the crossing with the Grand Rapids Eastern (ex GTW). To the right of 2008, just out of sight, is the bridge that carried the Pennsy (GR&I) over the creek. 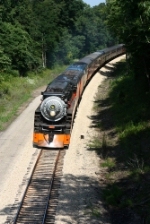 The PRR and PM paralelled each other north out of Grand Rapids until Comstock Park, where the Pennsy swung east across the PM and went towards Cadillac. Fuller Jct was once a busy place with PM (later C&O), PRR (later PC then CR) and GTW trains all passing through, and still sees around 4 trains a day. 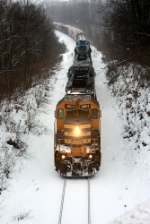 Description: NECR and MMRR are both part of the Rail America system, making sights like this possible! 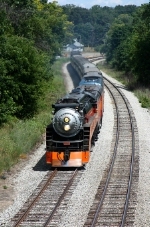 Title: NKP 765 steams north past the former site of the Woodard Furniture Co.